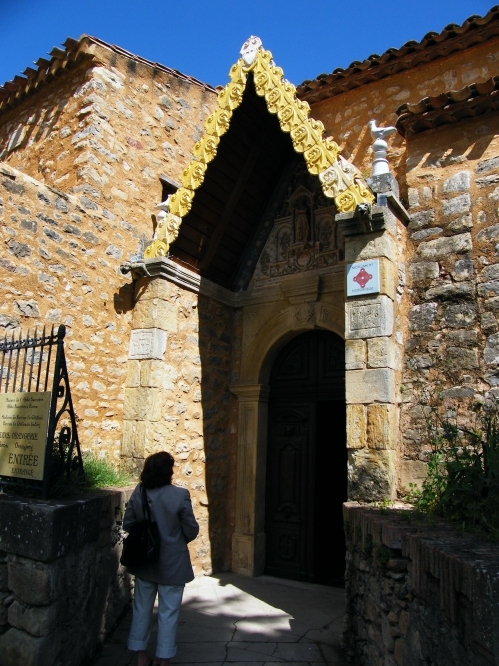 That's me, researching the church and its porch at Rennes-le-Château. And that's me as Pizza-eater in Rennes-les-Bains! 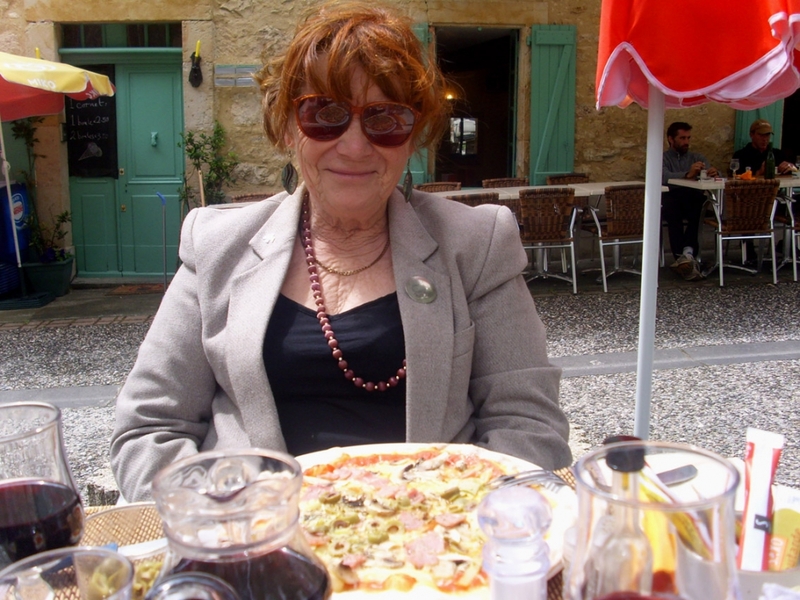 My name is Val Wineyard and I have been writing about this part of France where I live for some ten years, but it's more than thirty years since I first came to Rennes-le-Château. I now live at Couiza, the town on the Carcassonne-Quillan road, which is the nearest place with shops near to the famous citadel! I had read "The Holy Blood and the Holy Grail" and I can remember standing by Bérenger Saunière's grave and thinking "Why don't they let him rest in peace?" For he is famous now as the priest who found a fortune or treasure apparently so mind-blowing that it would change the world. I wrote my Rennes-le-Château book for two reasons. Firstly, I had often seen people wondering around Rennes-le-Château looking all around them, but really puzzled. I realised that they had heard about this place and visited it on a whim expecting to see traces of treasure and they were puzzled because they didn't know what to look for - surrounded by colour, images and mysteries they couldn't make head or tail of it. They needed a guide and I decided to write one. Secondly, I was intrigued by the priest himself; what had his life REALLY been like? What sort of man was he? Did he really discover the grave of Jesus or Mary Magdalene, or did he discover the treasure of Jerusalem? I looked at the background of religious life during those times. And I like to think I discovered what he knew. It wasn't long before before I started researching Rennes-les-Bains down the hill, the village of a priest called Henri Boudet, a great friend of Bérenger Saunière. The character difference between the hilltop and the river valley was immense, the social atmosphere of each was unique. I started to write a general history but I discovered it was a place with many mysteries and not just one! And so I wrote "The Sacred River of Rennes-les-Bains." The river passing through the town rises as a natural spring not far away, it is eternal and ever flowing. That is very symbolic. My friend Kris Darquis, who has just started the mammoth task of translating my books into English, describes the difference between the Two Rennes as this; "Rennes-le-Château is the centre of the search for a material treasure, maybe the Holy Grail as an actual cup, very precious, or buried gold, or something that will bring fame and wealth. But Rennes-les-Bains is a spiritual place, where one looks inward for incredible wealth, richness, maybe even eternal life." The material and the spiritual in equal balance? Yes, one needs both of the Rennes! I must add that my point of view on this site is very personal, this is all my own conclusions and research. If all we "Rennies" agreed on everything, life would be boring indeed! PS I have written many books about this region, writing is my life . . . you can see them by clicking here.